All 106 bedrooms at the Dragon Hotel have been refurbished to a high standard. All are non-smoking and air-conditioned, and all feature WiFi high-speed internet access. 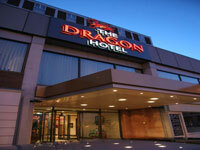 The Dragon Hotel is a Swansea landmark, centrally located and within walking distance of the city's key amenities, attractions, shops and vibrant nightlife. After golf enjoy a wide selection of champagne, cocktails and lite-bites in the relaxed, friendly and unhurried atmosphere of the Dragon Lounge.